Hottest Month is not so hot! Dry month to become wet? It has been noted that El-Nino usually causes an increase in the number of Western disturbances. The country has been witnessing continuous local thunderstorms formation since April that is keeping the temperature on the lower side although an El-Nino year is usually hotter than average. So far Pakistan only witnessed two heatwaves, one during the last week of April that was relatively strong and longer while the second one in early May was short and weak. May is the hottest month in the country although at this moment it has been less hotter than average. The heating trend might continue after the middle of May. According to the above picture, eastern parts of Pakistan are witnessing above 38° temperature while few pockets of central Sindh are witnessing 40°C temperature. 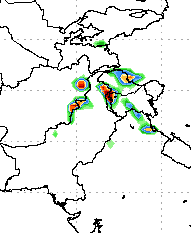 The precipitation image shows 99.9% Pakistan under the influence of thunderstorms which is very rare in the month and that too from western disturbance though Arabian sea’s moisture would play an important as well. Widespread rains at the door – Slight possibility of Pre-monsoon! WARNING: Authorities should be on alert as uncertain weather is expected in the upcoming week. Possibility of urban flooding in upper KPK and Azad Kashmir. Damaging windstorms cannot be ruled out! 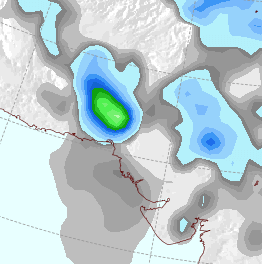 May usually witness isolated rains with strong dust storms but this May can turn out to be a rare one as widespread thunderstorm formation is expected. PWP Facebook on May 4 had stated that according to few numerical models heavy moisture build-up might be observed over Pakistan and adjoining western India during the middle of May, this moisture might be a result of western winds and Arabian sea’s moisture. On May 5, PWP did say that there ‘can’ be a east to west thundercloud movement during that week. According to the Indian Meteorological Department (IMD), an upper air cyclonic circulation over central Madya Pradesh has moved in a West direction, now this is significant move as such movement usually happen in the month of June which indicates pre-monsoon activity whether this UAC would have enough strength to merge with the western low pressure or it would cause thunderclouds to move into south Punjab and central areas of Pakistan is yet to be seen though both of these possibilities exist. Rain/Hail with thunder/lightning accompained by strong gusty winds (<80 km/h) might start from May 11 night in some north-western areas of the country and continue throughout the week with intervals. Heavy downpour might occur in Azad Kashmir and northern Khyber Pakhtunkhwa (Kohistan, Naran, Mansehre, Battagram, Shangla, Abbottabad and few adjoining areas), heavy rain can also occur in Islamabad. Strong possibility of rain with chances of isolated heavy rain in Lahore on May 12/May 13 and surrounding areas. This unusual activity might also cause moderate to isolated heavy rain in central and southern areas (especially Lower Balochistan and adjoining Sindh) of the country. Chances of light to medium intensity rain with strong winds in Karachi on May 15/May 16. There is a good probability that central areas of Pakistan (south Punjab) might experience some pre-monsoon activity due to the western-eastern interaction that might result in a east to west bound thunderclouds from May 15/May 16. Tropical activity expected in June? On May 4, PWP Facebook said that “Another model (CFS) shows another tropical depression in central Arabian sea, it’s track is disputed”. Now the same model shows that tropical depression moving towards coastal Sindh in June during the second week. Though it is early to trust this track. The Portal’s forecast what happened and what did not! The main features of the PWP’s forecast are discussed below. Overall the prediction went good. 1. Predicted: Possibility of urban flooding in upper KPK (Kohistan, Naran, Mansehre, Battagram, Shangla, Abbottabad and few adjoining areas) and Azad Kashmir. Reality: Authorities are now on high alert in Shangla after overnight heavy rains have caused mid level flood in the rivers. 2. Predicted: Damaging windstorms cannot be ruled out. Reality: High winds and lightning resulted in the death of 14 people across Pakistan while 40 were injured. 3. Predicted: Heavy rain can also occur in Islamabad. Strong possibility of rain with chances of isolated heavy rain in Lahore on May 12/May 13 and surrounding areas.Reality: Moderately heavy rain occurred in Islamabad on May 13 as 43 mm rain was recorded. Rain occurred in Lahore on May 13 though was not heavy as 15 mm was recorded. 4. Predicted: There is a good probability that central areas of Pakistan (south Punjab) might experience some pre-monsoon activity due to the western-eastern interaction that might result in a east to west bound thunderclouds from May 15/May 16. Reality: West and east interaction did occur as UAC was over NW Rajasthan though it did not cause east to west thunderclouds. From May 16 till May 17, 65.4 mm rain fell in Multan while 30.5 rain fell in Bahawalpur. 5. Predicted: This unusual activity might also cause moderate to isolated heavy rain in central and southern areas (especially Lower Balochistan and adjoining Sindh) of the country. Reality: 33 mm rain fell in Lasbella city of lower Balochistan while adjoining Sindh (Dadu got 40 mm) got good rain. 6. Predicted: Chances of light to medium intensity rain with strong winds in Karachi on May 15/May 16. Reality: Light rain with brief moderate falls along with dusty winds occurred earlier than expected that was May 14 and again on May 15 morning. 1 mm rain was recorded in the city. is there are chances of heavy rainfall in multan? Mostly light to moderate with slight chances of isolated heavy rain. Yes chances are there of rain. Very Informative Article Babar bhai. Thank you Fakhar. I would do my best to update. any strong windstorm in isb and khaur. How much intense rain can we expect in upcoming week in Mardan and adjoining areas? Farmers are busy in harvesting wheat crop. May Allah help us! According to charts it can be less than 50 mm in the coming week. on which date proper rain will start in multan? For proper rains wait till monsoon season. Walikum Assalam, not heavy but there are chances of light to medium intensity shower. Assalam O Alaikum DearBabar(Cyclone), welcome back with your interesting and thought provoking predictions. Yar it seems that this time weather would play some interesting moves rather i would say suspecious moves in May, June,July and August. Is there any chance that tropical depression could turned into a cyclone that would be formed in 2nd week of June? Yes as I mentioned there is a possibility of a tropical depression but the model doesnt show it turning into a cyclone yet. Good work Babar Bhai Mirpurkhas Sindh m heavy rains kb hogi? Have to wait till monsoon. how much rain will fall in Isb and khaur oil field.Will pre monsoon hit us in the 2ND week of June. Around 50 mm to 55 mm. A proper monsoon wave is not seen yet. Those are SW/Arabian sea clouds. Those clouds bring drizzle/shower to Karachi during the monsoon season. They keep the temperature at 30 to 33C! Those clouds are good! Salam Babar bhai what about Larkana City Weather ? is there any good spell of rain are possible ? is there are chances of heavy rainfall 10 May – 17 May in sui gas field balochistan and dera bugti? Slight possibility of rain with windy conditions during this week. jo aap ne karachi keliye rain kiforecast ki thi ke 15th and 16th may ko rain ho gi wo forcast abhi bhi baqi hai ya nhi becuz other websited are showinh no rain in karachi on 15th and 16th may and is saal 2014 ke summer me karachi wet rahe ga ya dry. Chances are still there as thunderstorm would be near Karachi. I cant say on the performance of monsoon right now in the city. AoA. Cool summer in Lahore 🙂 Yesterday and today, a wonderful thunderstorm in Lahore. Moderate to heavy rain with thunders occurred in Rawalpindi last night. The weather was very pleasant. Cannot say that right now. Would soon upload a monsoon-I article. bhai aap ne artical main kaha kay kay south punjab main pre moonson rain ho sakti hain from E towards W. 7 may ko ahmadpur east near bahawalpur main heavy rain hui the 10 mint kay lye From East towards West. us din main ne socha shayad ye pre monsoon ho pr conform nai kar paya. us din kay bad roz barish hoti hai from West to East. kya wo pre monsoon ho sakti hai? No the movement should be visible from the satellite. From the satellite it was W to E.
how many hours will the rain come in multan today night/tomorrow or friday? tomorrow chances will be on day or night? how many hours will the rain come in sui gas field balochistan and dera bugti tonight/tomorrow or friday? Tonight/tomorrow there are chances of rain. It can be light to medium in intensity along with dust winds. The chances would persist till Friday or even Saturday. is bound wind will bring heavy rain in multan?please reply quick. Light to moderate with chances of isolated heavy falls. AoA.Sir Bahawalpur me rain ho gi today…. I believe rain did occur in Bahawalpur. Bro is there still the possibility of the cyclone you were talking about in the 2nd week of june? please tellme. The scenario of a cyclone persist but the direction/track is still not fixed. okay bro as you see any chances in track towards sindh so please do post some article on it. Assalam o Alaikum various weather models suggesting El-Nino chances from 50-70%. Historically El-nino supresses Monsoon rains in Pakistan. Whats your opinion do wet cities like Rawalpindi and Islamabad don’t see rain in moonsoon if El-nino come into play? El-Nino changes are very high. El-nino can cause less rains e.g 2009 – In 2009, Islamabad and Rawalpindi got below normal rains, most rains came from western disturbance. AoA.Sir June ke Month me bahawapur me rains hon gi…any chances. Depends upon the pre-monsoon conditions.